Details relating to the Belgian Commemorative of 2016. 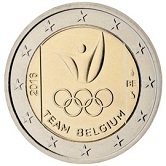 This coin celebrates the participation of Belgium in the Olympic Games of 2016 in Rio de Janeiro. The motif shows the official logo of the Belgian Olympic Committee, which was especially created for the 2016 games. Two vertical, parallel lines running from around ten to eight o’clock and from two to four o’clock divide the inner circle into three sections. The middle section contains a figure, the Olympic rings and the inscription “TEAM BELGIUM”; one under the other. In the left section is the year of issue, inscribed vertically and in the right section, around three o’clock we have from top to bottom – the mint mark the issuing country designation and the mint masters mark. Return from Belgian Commemorative 2016 to euro coin collector.